I have already reviewed the much acclaimed Carbonite Data Backup and Synplicity Data Synchronisation solution. 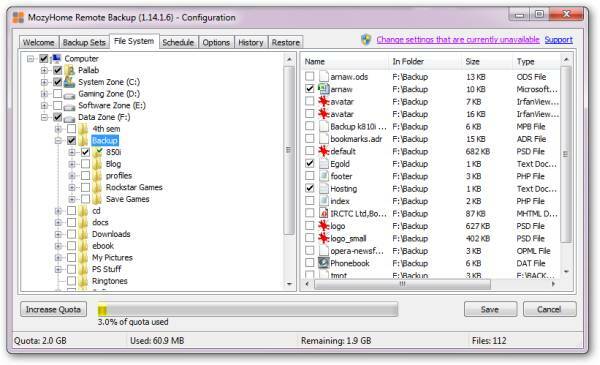 Today I will take a look at Mozy Backup – which is one of the most popular data backup solutions. Mozy has different solutions for home users (called Mozy Home) and enterprise users (called Mozy Pro). In this article I will be focusing on Mozy Home. You can learn about the differences between the two here.Mozy Home is available as a free download for Windows and Mac and provides up to 2GB of backup space for free. You can increase your online storage size by referring friends and relatives (1GB extra storage for referring 4 users) or by upgrading to Mozy Unlimited. Mozy Unlimited provides unlimited storage space and costs $54.45 per year. Installing and setting up the MozyHome backup client is extremely simple. After installation, it will prompt you to backup pre-configured folders and objects including Firefox and Internet Explorer Favourites, Music, Document and Pictures folders. One of my complaints with Carbonite as well as Synplicity was that they didn’t really provide a very intuitive interface for manually selecting files to be backed up. MozyHome’s inbuilt File System Explorer solves this problem and allows me to quickly backup selective files spread across multiple folders. Mozy definitely trumps the previously reviewed alternatives in this department. Additionally, Mozy allows you to backup external devices like USB hard disks. This wasn’t possible in Carbonite and is definitely another big positive for Mozy. However, unlike the other two Mozy doesn’t integrate itself with the right click context menu and you can’t directly mark a file or folder for backup from Windows Explorer. Another big disadvantage of Mozy is that if you delete any file on your computer, Mozy will automatically delete the remote copy of that file after 30 days. This seems an extremely strange thing to do since purpose of Mozy is to backup data. The one month backup does offer some protection against accidental data prevention, however ideally Mozy should keep the data in its servers till I manually delete it. Mozy automatically encrypts your data before storing it. You can specify your own encryption key or allow Mozy to pick one for you. I would strongly recommend using your own key for privacy and security purposes. Restoring Data with Mozy is fairly easy, however it may be very time consuming if you are dealing with large amounts of data. 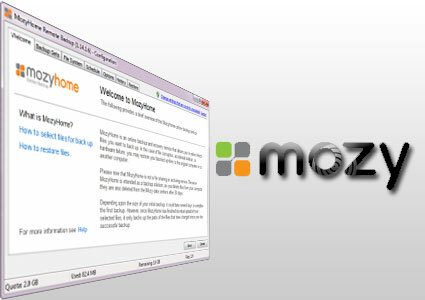 You can use the Restore function present in the MozyHome client or restore data from the web. If you are looking to restore large amount of data using the Web Interface is recommended. Once you select the files you want to download Mozy will send you an email containing the URL of a temporary zip file containing your files. While downloading a zip file is more convenient the downside is that Mozy takes some time to prepare the file. Mozy also integrates with your explorer shell and displays your remote backup folder as a virtual drive. If you enable the Overlay Icons feature Mozy will make use of tiny icons to indicate the current status of a file (backed up or pending backup). While Mozy is simple to use and has an intuitive interface it will also please the geeks. It provides plenty of options to tinker with. It supports automatic as well as scheduled backups along with bandwidth throttling. In my testing I never experienced any problem with Mozy; I have had an account for nearly a year now. However, I have seen people complaining about the MozyHome client’s impact on their computer performance. If this happens try reducing the backup speed and using scheduled backups instead of automatic backups. The best option is to simply download and install the MozyHome client and to check it out before upgrading to Unlimited. Based on my personal experience I won’t hesitate to recommend MozyHome. It makes backing up simple and painless. The client is lightweight and intuitive. And most importantly Mozy is owned by Decho Corporation, a subsidiary of EMC Corporation. It has over a million customers and also has a multi-million dollar contract with GE. In short Mozy has the financial might required to survive during tough times and isn’t likely to disappear all of a sudden. License : Freeware with 2GB space limitation. Offers.com is sponsoring a 1 year license of MozyHome Unlimited. MozyHome Unlimited gives you unlimited storage space and normally costs $54.45/year. i)Tweeting about the contest (1 additional entry) – Your tweet must contain a link to this post. You are free to use a custom message or use this message. You must post the link to your tweet here in order to be counted. Blogging about the contest (2 additional entries) – Blog about this contest and include a link back to this post. After publishing the post let me know by leaving a comment. The last date for participating in this contest is 13th July. Contest closes at 12:00 AM IST (or 6:30 PM GMT). Offers.com is also giving a 20% discount on the retail price of MozyHome Unlimited. That means you save $10.88 if you order through them. On top of that you get 1 month extra for purchasing an annual license of Mozy Backup. Offers.com is a bargain hunters dream come true. They offer exclusive discounts on a wide range of products. You can find attractive deals on everything from Vacation Packages and Credit Cards to Audio Albums and Software. The contest is over and the winner has been announced here. Data back up is a good thing. I have lost data on my computer before due to crashes. .-= Indo ContestÂ´s last blog ..Win a KP500 Cookie LG Smartphone from La Gazzetta del Calcio =-. Good article. I’m now sending my 2gb backup in. If this works as well as this review says, I’ll be going for the unlimited plan soon. .-= Submit Your ContestÂ´s last blog ..Karen on Win 2 free tickets to an Off-Broadway Musical =-. Very interesting…I’ve tried quite a few backup solutions, I found them all to be more of a PITA than I was willing to commit to since I keep nothing irreplaceable on harddisk anyway, as a rule. That should be all 4 points. .-= SenseiÂ´s last blog ..Win a Year of Mozy Online Backup =-. .-= NiharÂ´s last blog ..Firefox 3.5 is Released â€“ Download it! =-. .-= DeveloperholicÂ´s last blog ..ArchBasketball Free WordPress Theme =-. .-= Vega PunkÂ´s last blog ..Mozy Backup 1 Year giveaway =-. I’ve been putting off signing up for an on-line backup service TOO long. I think I’m going to give Mozy a chance. .-= gLfÂ´s last blog ..Win a Mozy Home Backup License =-. Any software that automatically backups the data online. .-= Free divingÂ´s last blog ..Scuba Diving- best outdoor Recreation =-. Thank your for the giveaway.I never heard this software before I hope I can win this. .-= suwariÂ´s last blog ..PsDeluxe firends contest =-. online backup has became important for protecting critical business information. There is an option to integrate Mozy into the right click menu. If you have the application already installed, go to the Configuration | Options | Advanced, then check the box for “show the restore option on the right-click menu in Windows Explorer”. If it’s a file or folder already being backed up, it will say “restore previous version”. If it’s something NOT currently being backed up by Mozy, it will say “add to Mozy backups”. Useful post, Backing up data is very important for sure. .-= Nimit kashyapÂ´s last blog ..Best Things To Sell On eBay =-. Backing up data is very important, especially with the amount of data we store on our computers. Mozy makes it easy with the fact that it allows you to back up your data to two different locations – to the Mozy servers, and to a local, external hard drive. Having two copies of your data definitely helps to ensure you won’t lose anything. Mozy is still good but ZenOK lets people keep 21 Gigabyte of documents or photos. This is 10 times more than competitors (like Mozy, Dropbox and Apple iCloud) give people. This means with ZenOK users can protect hundreds of thousands of files forever. The ZenOK Free Cloud testing preview is available on invitation only. You can get an invitation on http://free.zenok.com where you have to Pay with a Tweet or Facebook Like to get listed. Don’t forget, this post is over two years old. I don’t think ZenOK even existed when this was written. PS. I’m ignoring the fact that your post probably qualifies as SPAM.